“A collaborative culture” sounds good on paper – but how many businesses actually put this key piece of interaction in place? Collaborative workspaces seem to be a hot new trend in office layouts – and have proven to be beneficial to many successful organizations. 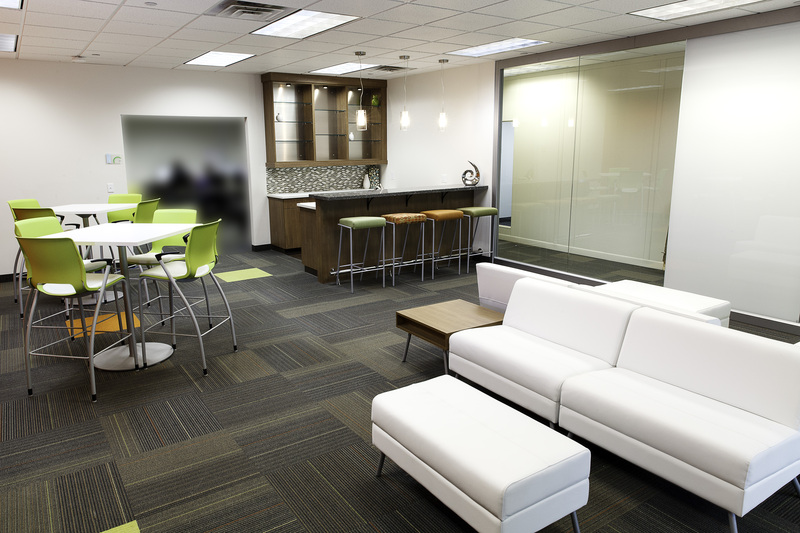 However cool they may look, the key part to collaborative workspaces can be found in the word itself – collaboration. Cool layouts are for naught if they aren’t used properly. We’ve touched on the benefits of collaborative workspaces on the Innovative blog before, but this post will focus on the importance of the action of collaboration – and how it will benefit you, your employees, and your business in the long run. When one thinks about “office collaboration”, the cliche phrase “two heads are better than one” comes to mind. In this case – that phrase is correct. Office collaboration provides you the opportunity to work with someone you may not always work with, in order to achieve a common goal. However, as outlined earlier, that common goal must be clearly outlined before collaboration is to being. By combining teams of coworkers who don’t often work together, new and multiple strengths can be uncovered. For instance, someone in finance may have a knack for the written word, or a member of the customer service team has a deep desire to design. When new partnerships are forged within the workplace, coworkers strengths can be uncovered – ultimately benefitting each other and the business as a whole. If one person in the office is tasked with something they are either unfamiliar with or something for which they are unqualified, it can turn into an inappropriate usage of time and resources. However, when multiple people are focused on one project – where each worker’s strengths are properly showcased – different employees can shine – and projects get completed more efficiently. Workplace collaboration allows businesses to efficiently complete important projects and initiatives. The more departments and employees involved, work can be distributed more evenly to those who have the time and expertise. Often referred to as the divide and conquer strategy – a larger team, consisting of six or eight individuals – where multiple members could each take a small specialized part of the project and accomplish it in a faster timeframe. 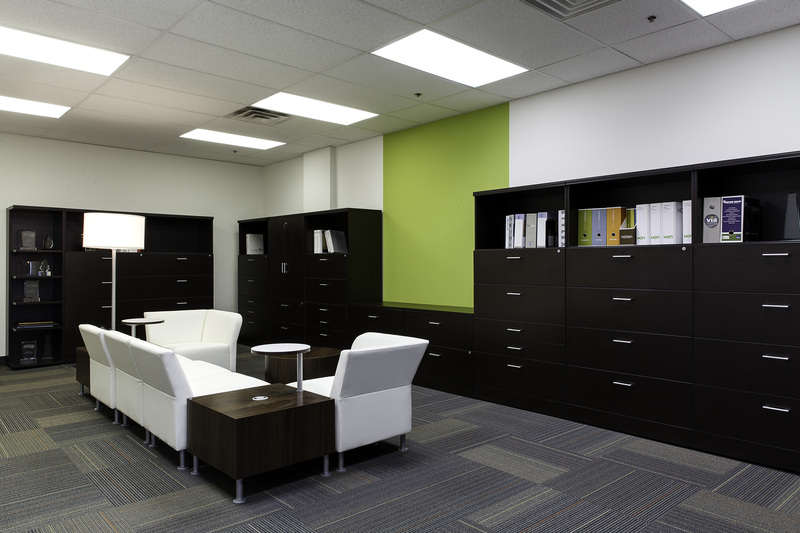 If you’re thinking about redesigning your office layout – or would like to learn more about the open office floor plan at Innovative Office Solutions – give us a call at 952.808.9900! It’s that time of year again – flu season. It may seem like whatever you do to prevent the flu, you somehow always get sick. But – could it be – that you’re not being germ-conscious in the right places? This blog post is timely not only for flu season approaching – but due to recent epidemics spreading across the globe. The more familiar you are with cleanliness best practices, the more well informed you’ll be when it comes to germs. The more conscious you are when it comes to these issues – the healthier you and your family will be during the entire year. 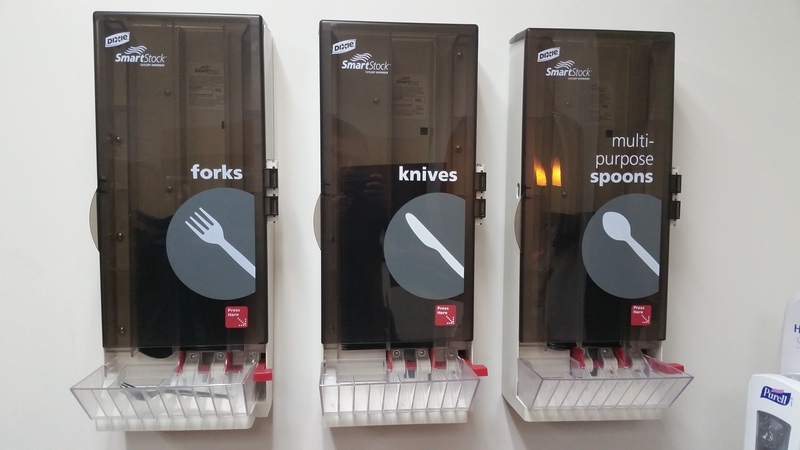 One product we’d especially like to showcase here – one we have in our office, in fact – is the SmartStock® Utensil Dispenser. With one pull of the red lever, a utensil of your choice is dispensed – doing away with multiple hands rummaging through a box of plasticware. A device like this – especially used in an office setting – may greatly reduce the amount of germs spread at the workplace, and keep folks healthier for longer periods of time. For more information on this – and other hygienic products – visit our Innovative Office Solutions website or contact Customer Care 952.808.9900 for more info! And just how dirty are everyday devices and surfaces? Yes – you read that correctly. Pilot, your favorite pen company, is literally breaking the mold on writing utensil creation. Read on to check out their awesome new project! 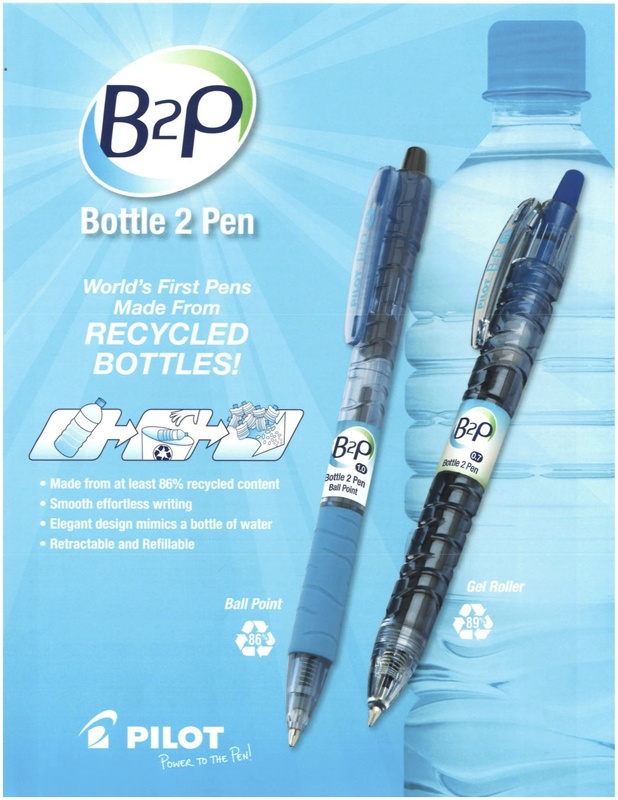 Pilot’s product, Bottle-2-Pen (B2P), is the world’s first pen made from recycled bottles. Approximately 2.5 million plastic bottles enter landfills every hour in the United States, and make-up close to 50% of all recyclable waste. The B2P gel ink pens are made from 89% post-consumer recycled plastic bottles. As to be expected from Pilot, the B2P pens write smoothly, have vibrant inks and are 100% refillable. The world”s first pen made from recycled bottles! Write the next chapter for a cleaner planet with B2P! For more information – and to learn how to support this innovative and responsible product – contact contact Innovative Office Solutions Customer Care 952.808.9900 for more info! 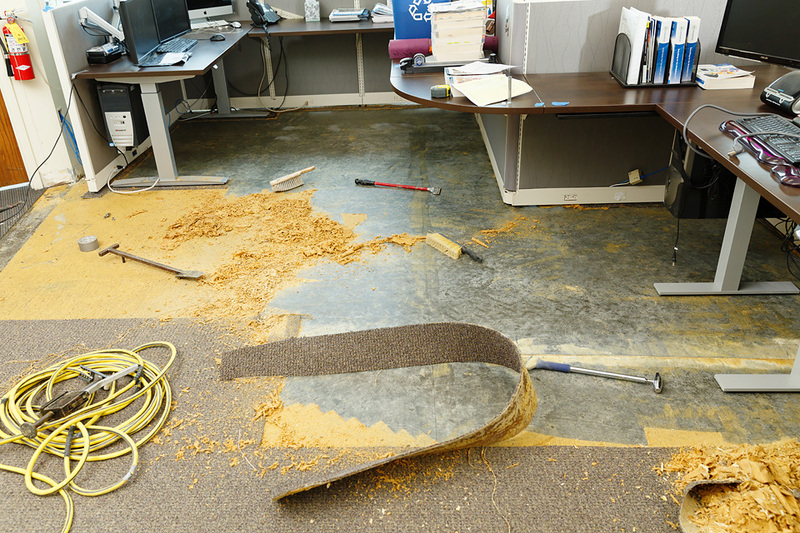 A year ago we expanded our offices and remodeled, but an existing section of office went untouched and it was time to put down some new carpet to freshen things up a little. If you look at the picture to the left you’ll see a lot of cubicles (19 to be exact), and putting down new carpet seems like a daunting proposition. I asked how long this would take to remove sections of furniture in order to replace carpet. The answer was quite surprising. “Oh, we don’t remove it, we lift the cubicles up and replace the carpet right underneath.” – I must admit, when this was first described to me I had visions of an orchestra playing as all of the cubicles in the space rose up like the Lost City of Atlantis rising out of the ocean. Alas, the reality is much less dramatic, but that’s a good thing. 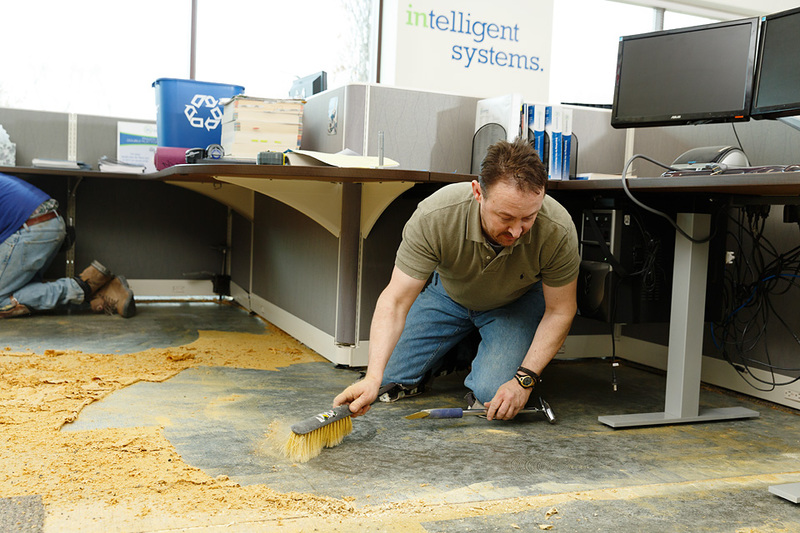 After all, when we’re talking about disrupting a workspace to replace carpet, you want it to happen quickly and without a lot of theatrics. The reality is there is a winning formula which makes this project go smoothly, quickly, and with minimal disruption. 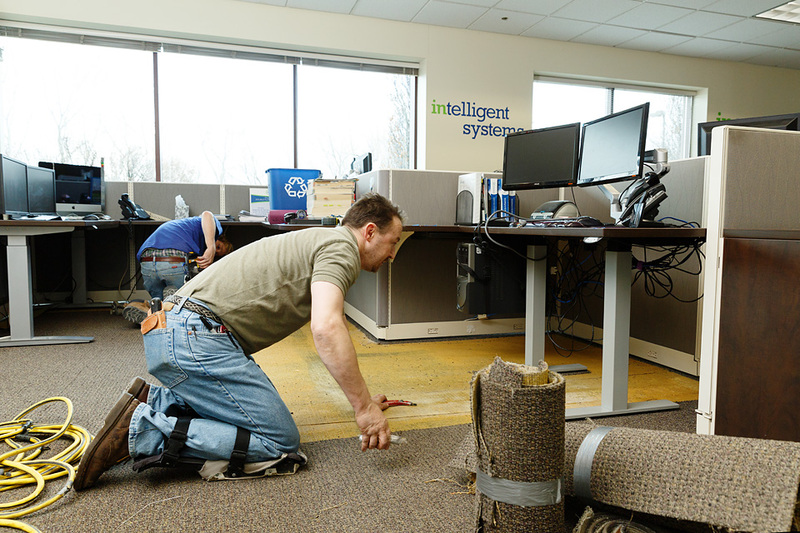 It begins with the concept of carpet tiles and ends with the right team doing the work. 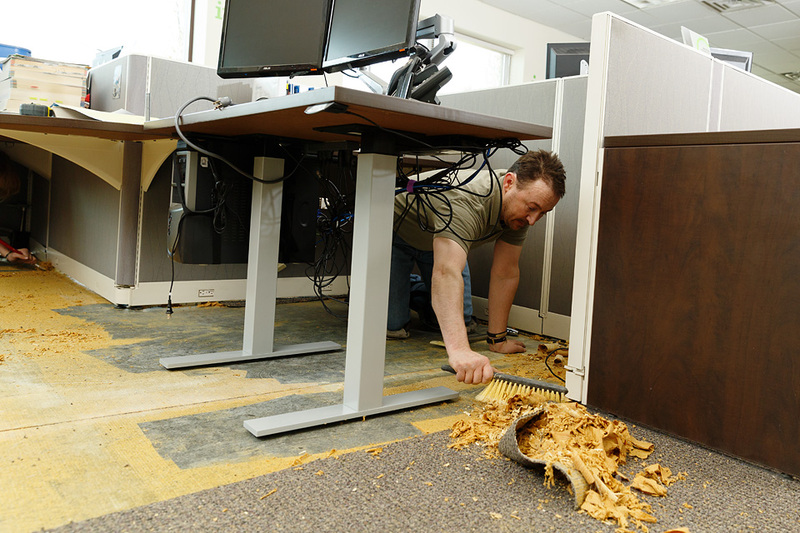 The process involves removing the existing broadloom carpet, and replacing with carpet tiles. In addition to providing interesting design options and easy tile replacement in the case of stains or traffic wear, it allows you to carpet an area without removing the furniture. 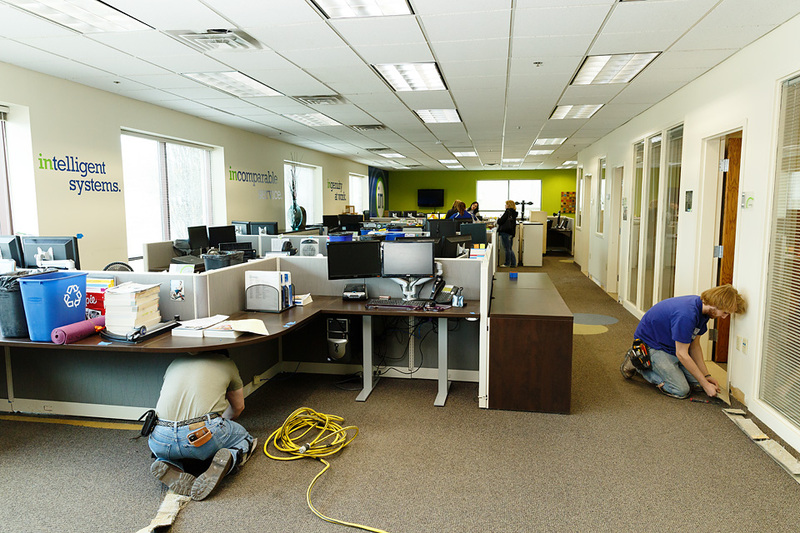 The team performing this work for Innovative and our customers has the right mix of carpet installers and furniture installation experts on a single team. Having all of this expertise on one team without sub-contracting is rare. I knew our company did this type of work, I’d just never seen it in action so I was naturally excited to record it and tell the story. 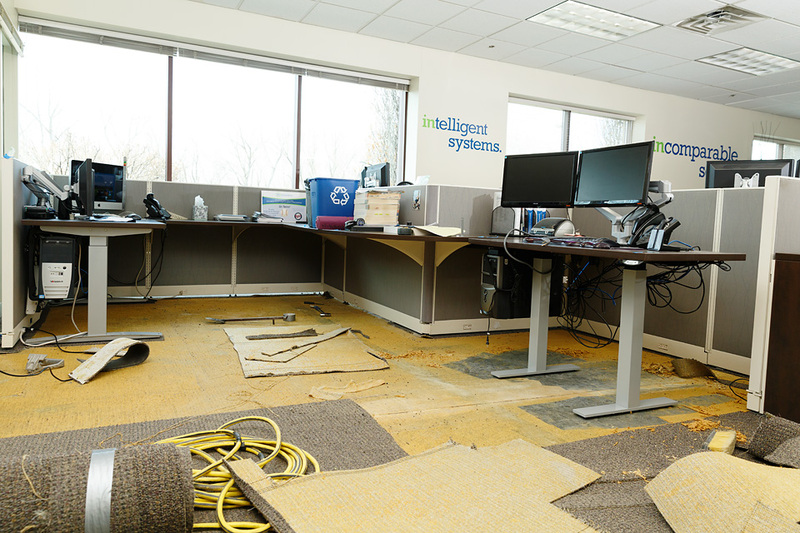 Installers began by removing anything mobile from the area, and then came the work of removing the old carpet and glue, and then replacing with carpet tiles. To get underneath the cubicles, they used a variety of tools and tricks that would lift small sections by a couple of inches, just enough to work underneath. It’s very important to work with an experienced team to eliminate the risk of damage in the lifting process. Without knowing how the process worked, if someone had asked me how long I thought this would take, I’d have guessed a week or more of terrible disruption. The reality? This project was completed in two evenings after employees had left for the day. Now that’s how to replace carpet! Originally thought of as eccentric, standing while working was a tactic once used by well-known thinkers. However, as the trend begins to catch on more and more in the workplace, research has found the benefits of standing throughout your workday can help fight obesity, diabetes, cardiovascular disease and even forms of cancer. At first you may think to yourself, “I couldn’t stand for 8 hours – that sounds incredibly tiring,” or “I have back issues, I need to sit.” If you’ve had similar thoughts, you’re in the majority as standing at work all day is often seen as a form of unintended punishment. However, research suggests that standing – or being more active – while at work can help improve muscle and back aches from which you may suffer, as well as create an all-around healthier “you”. Now, the more active employees may choose to exercise over their lunch hour or soon after work, but research has shown that these activities don’t help counteract the toll eight hours of sitting can take on your body. According to Smithsonian, instead of strenuous exercise over the lunch hour or immediately after your workday, learn to incorporate standing, pacing and other forms of activity into your normal day—and standing at your desk for part of it is the easiest way of doing so. This isn’t to say stop exercising during off-hours, you just may not be doing your body as much good as you think. Not only does standing more often help you become more active and help promote proper blood flow for longer periods of time, it can also increase focus. These workplace benefits are great, and should be proof enough to consider incorporating sit-stand workstations into your office. The long-term benefits, however, seem to far outweigh the immediate perks seen at work. It’s no surprise that America has one of the highest – if not the highest – obesity rate in the entire world. Factors such as diet and lack of exercise are surely to blame, with sedentary work environments being an equal contributor to the obesity epidemic. “The key to reducing the risk of obesity,” according to Smithsonian, “is consistent, moderate levels of movement throughout the day.” With increased advances throughout different work environments daily tasks are easier and less physical exertion is required to complete certain tasks. Motivation to stand and be active throughout the day is also increasingly up to the worker. At the 2011 annual meeting of the American Institute for Cancer Research, Owen presented data showing that adults are sedentary for 9.3 hours of the day, which amounted to 60% of their time spent awake. Another 6.5 hours (or 35% of awake time) were spent in “light activity,” such as walking to one’s car. What can be done to decrease cancer risk due to sitting? You guessed it – be more active at the office. If a sit-stand workspace is out of the question, walk over to a co-workers desk instead of sending an e-mail, go to the water cooler more often than necessary (this will also keep you more hydrated), or simply stand up and walk around more frequently than you do currently. The more you move, the better you’ll feel in the short and long-term. According to Christine Friedenreich, an epidemiologist at Alberta Health Services Cancer Care in Canada, breast and colon cancer appear to be the cancers most influenced by physical activity. The less physical activity or exertion, the higher your risk of developing these cancers. This is due to higher levels of inflammation caused by staying seated for extended periods of time. The higher levels of inflammation, the greater increased risk of developing cancer. As excited as you may be to start experiencing the benefits of standing more at work, experts suggest workers ease into this new posture. Let your body become used to the strain. As foreign as it may be to many office dwellers, it is equally foreign to your body. Also – move around, shift weight from side to side, stand on one leg, whatever you need to do to stay comfortably standing for extended periods of time. At first, split time between standing and sitting, because actually standing all day can lead to back, knee or foot problems. By using a desk that can be raised, as well as using a tall chair that you can pull up to your desk when you do need to sit, you’ll be able to rest your legs when you feel the need, and stand when you feel like standing. Melissa uses Trendway Base that comes equipped with a Dual Stage base and control pad with a digital readout which can store up to four pre-set heights. Pre-set heights work well in an area with multiple users, who can all have their comfortable standing height saved. Some vendors with a more ergonomic focus include Workrite, ESI, Humanscale, Mayline, and Conset. These manufactures offer a large variety of sizes and configurations, with some offering many other ergonomic products like monitor arms and keyboard trays that pair well with the sit-stand bases, creating a more ergonomic posture. 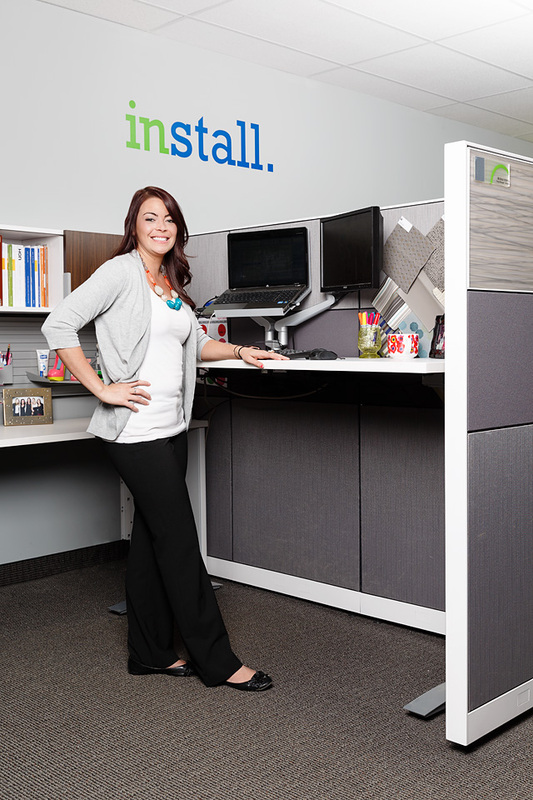 Visit our website to learn how we can outfit your office with sit-stand workstations, and how you and your office workers can begin to experience the positive benefits associated with increased movement throughout the day. 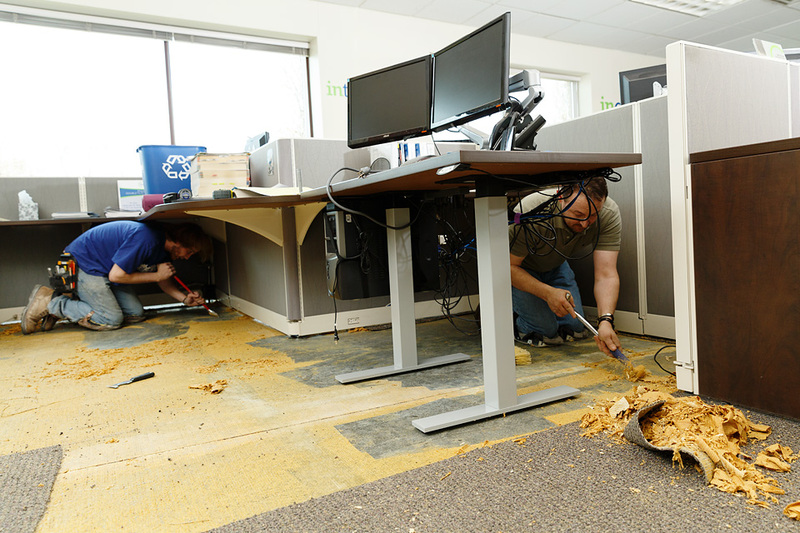 The wrath of poor weather conditions can be averted when high-performance matting systems are implemented throughout the workplace. Minnesota winters are cruel – cruel on the roads, our cars, and our sanity. One place that is often overlooked when it comes to poor weather conditions is the workplace. Tracking in dirt, water and salt can take a toll on the entire building, leading to expenses that can easily be avoided. With high-performance matting systems however, facilities can stay clean, healthy and safe year-round. In today’s world, rarely do we have time to stop and sufficiently wipe our feet before we walk into a building. A common practice in the workplace is to simply lay a mat or rug at the entryway in hopes that others will stop and wipe off the excess under their shoes. While most may stop and quickly wipe their shoes, certain mats don’t perform as well as others, leading to quickly worn mats that can damage the floor beneath and ultimately a dirty workplace. Effective, high-performance matting systems are designed to keep dirt, salt, water – most anything a shoe can track in – at the door. 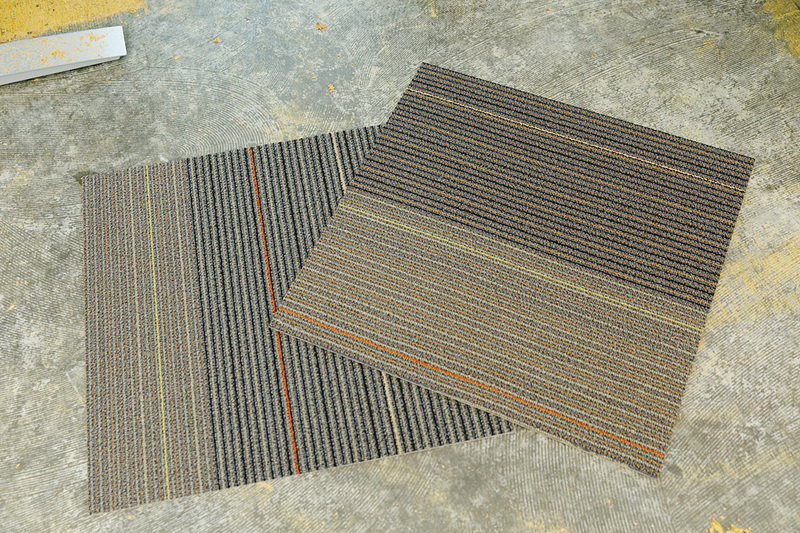 Unlike other mats and rugs, high-performance mats have the ability to keep the excess beneath your feet from spreading throughout the workplace. 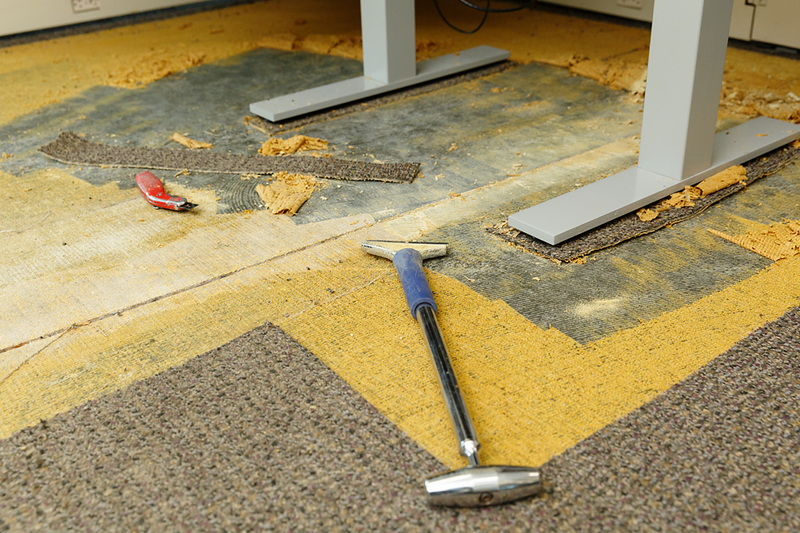 This happens due to “two-level” or “bi-level” matting – where users walk on a higher level, causing excesses to fall to a lower level, preventing further spread of dirt and water. You say effective – but how effective? 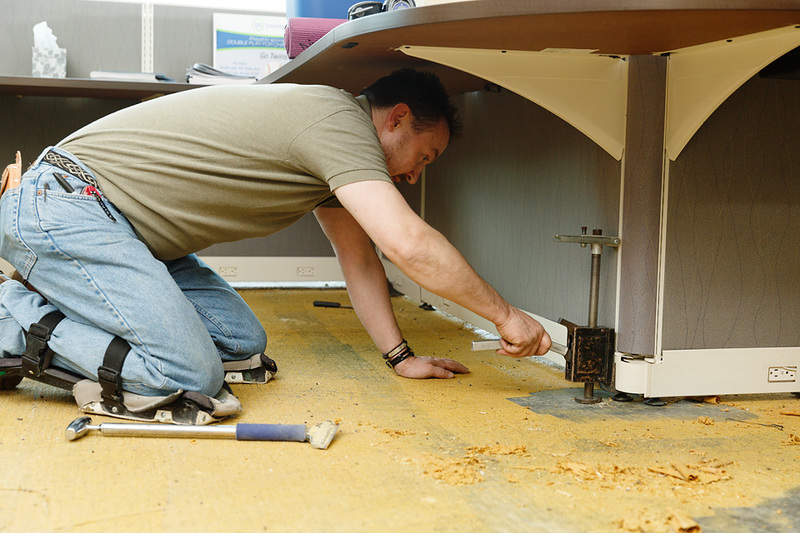 Proper matting not only increases office cleanliness, but safety as well. The National Safety Council estimated the cost of a slip-and-fall accident in the United States to be $50,000 on average – taking into account lost time, workers comp, and medical costs. 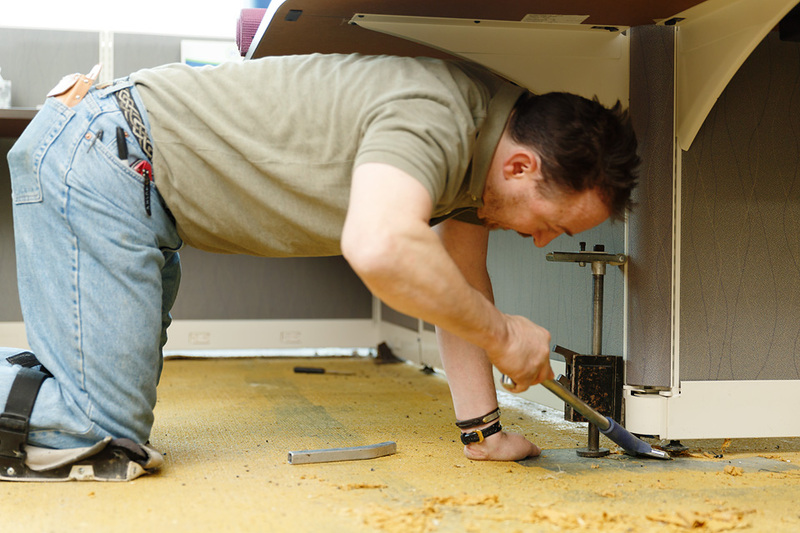 These accidents and their costs could be avoided by having effective matting systems in place. High-performance matting systems are manufactured using higher quality materials and come with a warranty guaranteeing their quality and life expectancy – which customers can expect to last a year if not several, making them extremely cost effective and a tremendous investment for the workplace. When comparing mat rental to purchasing, there can be a significant savings. 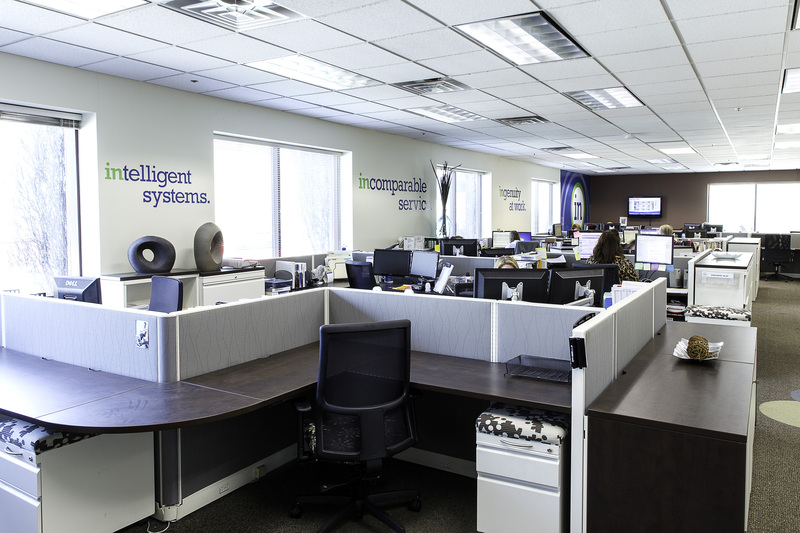 In a recent example with an Innovative Office Solutions customer, they cut their annual expense by 50%, saving a total of $2,400 per year. 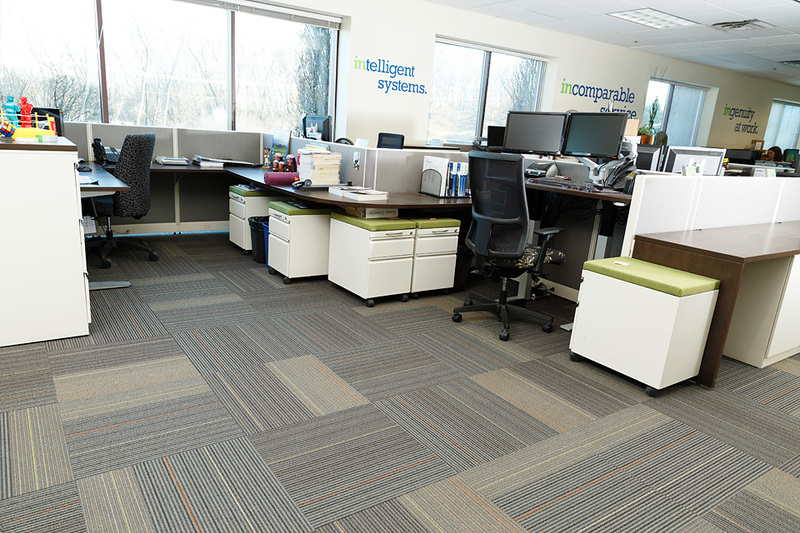 For an assessment of how Innovative Office Solutions can help keep your workplace clean and how two-level matting systems can continually help save you money, contact one of our Facility Specialists at cs@innovativeos.com.